MINIMUM 4 DAY RATE ON TRAILERS. Features: Vacation is the dream we carry with us throughout the year. It is the escape from our day to day cares and a place where we connect with those we love. Vacation is not just a location; it is a state of mind. When you are ready for vacation, Summerland takes you there. Available In: St. Cloud, Ramsey, Brainerd, Long Prairie & Sioux Falls! 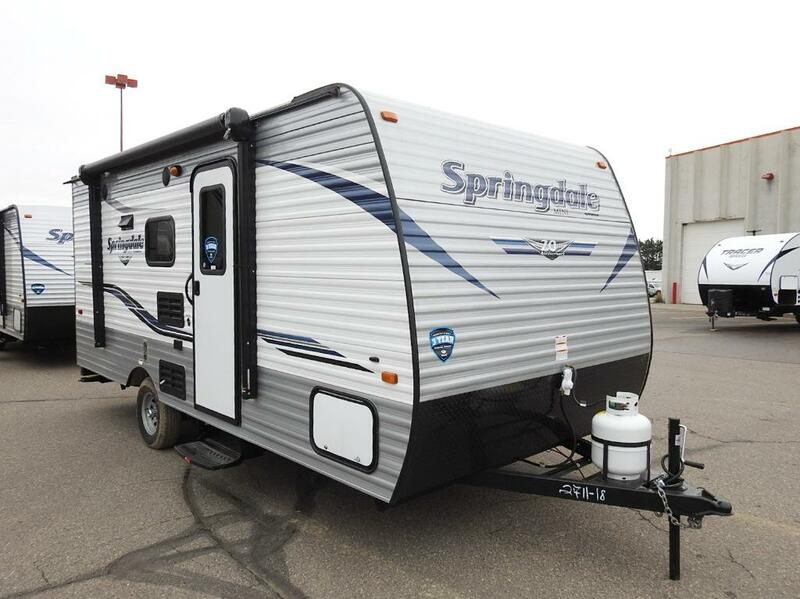 Travel Trailer reservations require a pre-paid rental fee of $200. Balance of rental fees, extras and a damage deposit of $750 are required when unit is picked up. Damage deposit could be forfeited in whole or in part for loss of equipment, interior or exterior damage, interior and exterior cleaning, refueling of propane, sales tax due and holding tank dumping. Travel Trailers rented a minimum of four days May 1 through September 15. Renters must be 25 years of age or older. All renters must hold a valid drivers’ license and provide an insured automobile policy. We accept money orders, cash, cashier checks, Visa, MasterCard, Discover and American Express. Pick Up Time is scheduled between 2:00pm and 4:00pm, earlier if unit is ready. NO EXCEPTIONS! Return Time no later than 11:00am NO EXCEPTIONS! Late returns are subject to a $200 late charge plus daily rental fee. No Saturday, Sunday or Holiday pick ups. Propane tanks are filled when unit is picked up and must be returned full. NO SMOKING OR PETS allowed in rental units. Provide proof of insurance on rental units. Cancellations made prior to 30 days of rental are subject to a $50.00 cancellation fee. If cancellation is made within 30 days of rental, all pre-paid rental will be forfeited. The relationship between parties to this contract is that of Lessor and Lessee. Lessees are not and shall not hold themselves out to be an agent or employee of Lessor or in any other capacity other than Lessee. Lessee shall have no authority to represent or make any commitment binding upon Lessor. Lessee acknowledges that they have carefully examined the RV and all additional equipment and furnishings and acknowledges receipt of same in good condition. Lessee agrees to maintain the RV in strict compliance with the MANUFACTURER’S SUGGESTED MAINTENCE PROCEDURES and in accordance with Lessor’s instructions given to Lessee, and to periodically examine the RV, including the tires, oil, water, transmission and all other fluid levels as applicable. Lessor provides normal maintanence and road repairs, including necessary oil and lubricant expense. Expenditures for repairs will be credited toward rental charges, upon receipt of proof (including replaced parts) that said expenditures were incurred. Lessee agrees to contact Lessor by telephone at Lessor’s expense if any repairs in excess of $75.00 are required, to obtain Lessor’s authorization for repairs at an authorized agency, and to keep record of the same. Any such authorization given shall not constitute a waiver of Lessor’s right to charge Lessee for such repairs, if in the opinion of Lessor; such repairs were due to negligence, misuse or carelessness by Lessee. Lessee shall not permit any lien to be placed on the RV. Lessee is responsible for all damage to, or loss of, the RV, loss of use of the RV while it is being repaired, diminution of the RV’s value caused by the damage to it or repair of it, missing equipment, and a reasonable charge to cover our administrative expenses connected with any damage claim, regardless of whether or not you are at fault. Lessee must report all accidents or incidents of theft and vandalism to the police as they are discovered. Damaged glass, tires, rims, and components of the undercarriage are the responsibility of Lessee and not Lessor. If the RV is inoperable for more than 24 hours, Lessor’s liability to you is limited to the daily rental rate times the number if days vehicle is inoperable. Malfunctions of the radio, air-conditioning, refrigerator, cruise control, microwave, generator, or any other malfunctions of convenience items are not. Lessor will provide liability insurance that is primary, and will provide coverage for bodily injury and property with limits no higher than the minimum levels prescribed by the vehicular financial responsibility laws of the state where the damage or loss occurs. Lessor’s insurance covers PIP, medical payments, no-fault and uninsured and under-insured motorist coverage. Lessee must meet the qualification requirements for Lessor’s insurance and no RV will be leased unless Lessee so qualifies. Coverage applies in the United States, its territories and possession, and Canada. Coverage is void if Lessee violates the terms of this Agreement, or if Lessee fails to cooperate in any loss investigation conducted by Lessor or its insurer. Giving the vehicle to an unauthorized driver terminates Lessor’s liability insurance coverage. If Lessee is an insured under a policy of insurance which covers any loss or damage resulting from the operation of any rented vehicle, Lessee shall exercise all rights available under said insurance, take all action necessary to process said claim, and provide any and all proceeds from insurance to Lessor. In the event of an accident, Lessee will advise Lessor IMMEDIATELY and submit a full written report to Lessor within 72 hours. Lessee agrees that the RV will only be operated by Lessee unless prior arrangements have been made for other driver’s to operate the RV. Lessee further agrees that any individual who is under the influence of alcohol or narcotics of any kind will not operate the RV. Lessee agrees that the RV will not be used for illegal purpose, be driven over rough terrain, be used for towing another vehicle or trailer (unless authorized by Lessor) or be driven in excess of safe speed with regard to prevailing conditions. Lessee agrees to pay all traffic and parking violations. The number of miles over which the vehicle shall be driven pursuant to this contract shall be determined by reading the odometer attached to the vehicle, with which the Lessee agrees not to disconnect or other wise tamper with. Any tampering with the odometer shall entitle the Lessor to set an arbitrary charge equal to 1000 miles per day of use. Lessee agrees to return the RV in the same condition as when rented, except ordinary wear. Upon departure fuel tanks & LP are full and must be refilled to avoid a refilling charge of $5.75 per gallon. The unit must be cleaned inside and out or a cleaning charge will be assessed. Lessee agrees that in the event Lessor is unable to make the RV available to Lessee for the terms of this agreement, all prepayment by Lessee will be refunded and further agrees that Lessor shall have no liability beyond this point. Lessee agrees that NO CREDIT OR REFUND will be given if the RV is returned prior to the expiration date of this contract, and in such event, Lessee will still be required to pay all charges as if the RV were returned at such date. Lessee further agrees to pay Lessor for any period during which the RV is held beyond the expiration time on this contract at the rate of $200 plus daily rental fee. Lessee further agrees to pay upon demand by Lessor any rental fees lost to or liabilities incurred be Lessor due to down time of the unit for the repair of damage or collision damage caused by Lessee. In the event of a breach of any terms and provisions of the contract by Lessee, Lessor may without prior demand, take possession of the RV by entry upon Lessee’s premises if necessary, with or without due process of law. In the event of any breach, Lessee shall be liable for all expenses incurred by Lessor, including reasonable attorney’s fees and court costs expended to enforce collection, and in addition, lessee shall be liable for all damages suffered by Lessor as a result of such breach.